This course will teach you the basic principles and techniques of self defense. You will learn practical skills that can be done to defend yourself against an attack no matter your gender or size. 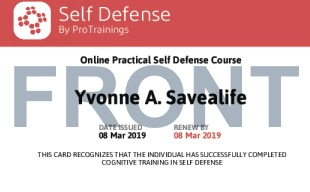 This course includes topics like overcoming the fears of self defense, using pepper spray, and physical skills to neutralize and escape an attacker. Everyone should learn self defense! 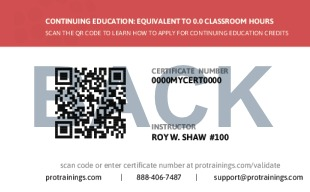 Total course time includes 1 hour and 8 minutes of video training as well as knowledge reviews, final test, remedial help and reviewing downloaded material.